The life of Casanova, a magnificent fresco of the cosmopolitan and libertine life of the XVIII century performed in the Ridotto hall, the first public gaming room in the world and favorite place of Casanova in the Carnival time. 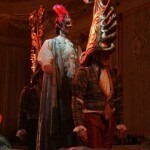 The music theatre show, written and directed by Fabio Momo is taken from the “Memoires of Giacomo Casanova de Saintgal, written by himself” and performed by singers, dancers acrobats and a live orchestra in the unique costumes of the Atelier Tiepolo. After the dinner: historical group dances and waltzes directed by a Dance Master.